The move is complete and just in time for tonight’s First Friday event. I am in a great corner studio with lots of space. Tom, my very handy husband has been painting, pounding nails into brick and hanging artwork from the highest heights to make a really beautiful studio space. After today, the real work begins. My friend, Pattie Lamb has loaned her Schacht Baby Wolf loom for me to use for the next six months. So, I’m ready to start some new weaving projects. 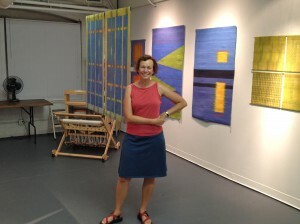 I’m sorry to be leaving the wonderful weaving lab at NC State University, but SO excited to be in my own studio. Come see what I’m working on any time. But for a big evening of Raleigh art and dining, come to Artspace for the First Friday Gallery Walk. All 35 Artspace studios are open 6-10pm the first friday of every month.